An attractive and functional addition to any rec room, college dorm or entertainment room. 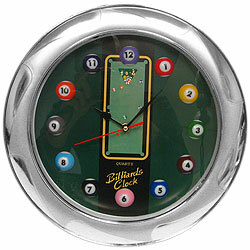 This clock features small pool balls for every number on the clock's face. The background is colorful illustration of a pool table. The clock uses a quartz movement for accurate timekeeping. Its frame simulates highly polished metal. 13 inches in diameter - 1.5 inches deep.